Social media today has greatly changed the landscape of our society and how we view it. We can now access rich amount of data and resources available in the internet, like blogs, where people have the power to share their thoughts. But with this power, comes a responsibility. It is important for new and seasoned bloggers to keep in mind what are the best blogging practices. One event that advocates this is the #CBSTalks: Best Blogging Practices presented by Cebu Bloggers Society (CBS), Waterfront Cebu City Hotel and Casino and Smart Communications. 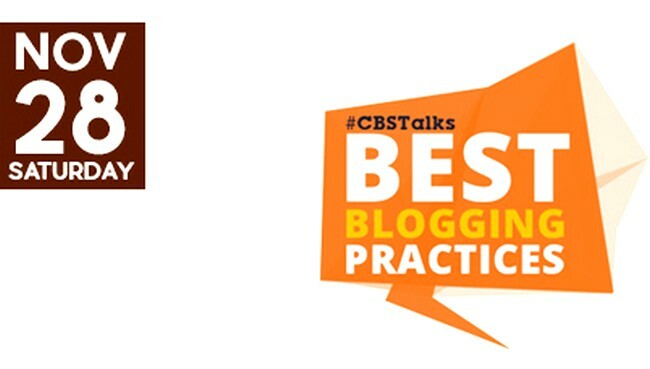 Cebu Bloggers Society will be holding the #CBSTalks: Best Blogging Practices which is one of their major events this year. It aims to promote best practices and nurture professionalism in blogging and social networking. It is patterned after the rousing TED Talks where some of the best digital influencers from Cebu and Davao will share their personal inspiring stories. They will talk about best practices related to content, website management, ethics, and online interactions which will be captured on film and uploaded on Cebu Blogger Society’s YouTube channel, website and other social media channels. Catch this FREE event on November 28, 2015, 9AM-4PM at the Jimei Room of Waterfront Cebu City Hotel and Casino. Visit http://www.cebubloggers.com/cbstalks for more registration details. This is organized by the Cebu Bloggers Society, Cebu’s first and premier blogging organization, established on February 14, 2008. Smart Communications, Inc. (Smart) is the Philippines’ leading wireless services provider. Waterfront Cebu City Hotel & Casino is the official venue of #CBSTalks. The hotel is grandly situated at the heart of the city’s commercial and business district. A convenient 30-minute drive from the Mactan International Airport, the hotel is home to 561 guestrooms and suites, 10 wining and dining outlets, and is popularly known for its superior meeting and conference facilities. With a seating capacity of up to 4,000, the hotel’s Convention Center is outfitted with 4 function rooms and 2 grand ballrooms designed to host all event types and sizes. Megaworld Corporation is the Philippines’ biggest developer of integrated urban townships and the largest lessor of office spaces. As the country’s pioneer in integrated urban township developments, Megaworld now has 18 townships all over the country. The Megaworld Group has around 4,000 hectares of land in its portfolio. Around 80 percent have been dedicated for LIVE-WORK-PLAY townships or mixed-use communities, the concept of property development that Megaworld pioneered in the Philippines way back in the 1990s. The townships combine the residential, office, commercial, retail, recreational and institutional components to form mixed-use communities. Cebu Pacific Air is the Philippines’ leading airline. It remains to be the pioneer in creative pricing strategies as it manages to offer the lowest year-round fares for all its flights. CEB currently operates a fleet of 47 Airbus (9 A319, 32 A320 and 6 A330) and 8 ATR 72-500 aircraft, one of the most modern aircraft fleets in the world. Islands Souvenirs revolutionized souvenir shopping by transforming cottage-industry type products and giving it a fresh take. It carved out a new niche for itself by providing premium quality souvenir items that are creatively designed and packaged in vibrant shopping environments. Maison des Fleurs Cebu Flower Shop is a flower shop in Cebu city and your personal florist online. They offer flower deliveries, wedding giveaways and party souvenirs like wines and perfumes. For full list of speakers, their topics and profiles, visit http://cebubloggers.com/cbstalks/.